Our luxurious hand & foot treatments will leave you perfectly polished and ready for any occasion. A traditional nail experience. Nails are shaped, followed by cuticle care. Hands and forearms receive a luxurious massage with our moisturize infused specialty hand lotion and nails are finished with the polish of your choice. A decadent experience for your hands. Nails are shaped, and cuticles cared for. Hands are then exfoliated, and massaged with an oil infused moisturizer before indulging in a warm paraffin wrap. Nails are then polished to perfection. A wonderful treatment to diminish age spots as well as fine lines and wrinkles. 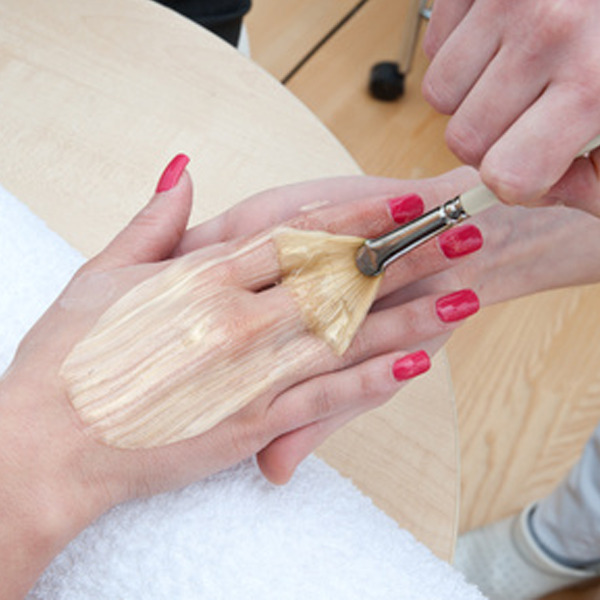 A mild chemical peel is applied to the backs of the hands to reveal smoother younger looking skin. Treatment includes a delightful hand and arm massage. When you’re short on time or just need a bit more than a polish change, our petite pedi is just what your toes need. After a 10 min soak, nails are shaped, buffed and cuticles trimmed, finishing with polish of your choice. A traditional pedicure in which feet are soaked in a relaxing infusion followed by nail and cuticle care. The tech then uses a foot file and foot scrub on the heels and balls of feet to smooth the skin. Includes a foot and leg massage and polish of your choice. A “step” above the rest. After a relaxing soak, nails and cuticles are shaped, buffed and trimmed. Includes additional foot filing to tackle tougher calluses. Feet and legs are exfoliated with a delicious orange scrub including fresh orange slices followed by a wonderful moisturizing massage. Feet are then given a moisturizing masque and wrapped in hot towels. Includes polish of your choice.